On 9 August 1961 General Walter Bedell Smith suffered a heart attack at his home in Washington and died in the ambulance on the way to Walter Reed General Hospital. He was sixty-five years old and had retired. From the hospital his body was taken to Gawler's funeral establishment where it remained while funeral arrangements were completed. By virtue of his rank, General Smith was entitled to a Special Full Honor Funeral, in which the Army was the sole military service to participate. But in deference to the wishes of Mary Cline Smith, the general's widow, a distinctly different ceremony was actually held. 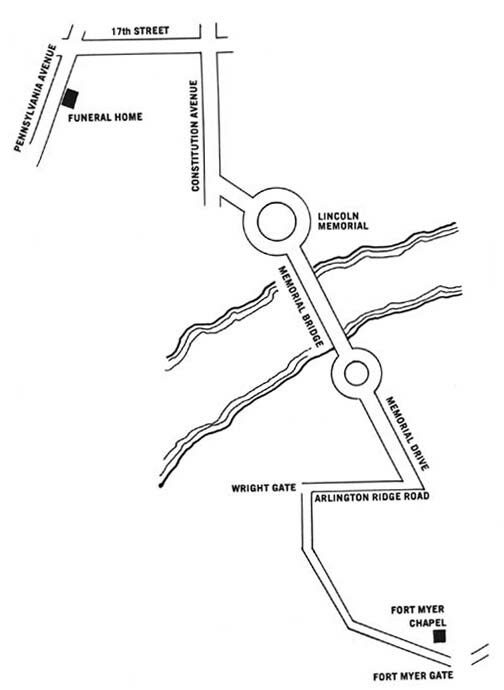 Mrs. Smith made her wishes known on the morning of 10 August, when she conferred in the offices of Arlington National Cemetery with the officer appointed from Headquarters, Department of the Army, as the official aide to the next of kin, the ceremonies officer of the Military District of Washington, and the assistant superintendent of the cemetery. 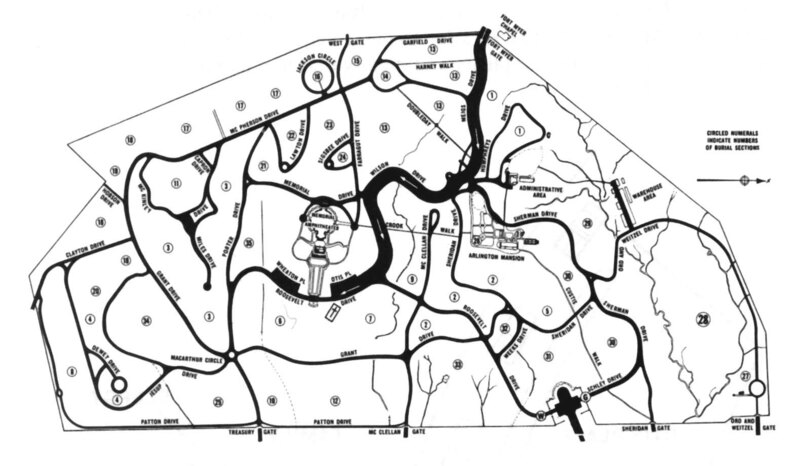 At that time she selected a gravesite for her husband in Section 7 of the cemetery, very near the grave of General of the Army George C. Marshall, and requested that his funeral be patterned after the simple joint service funeral given General Marshall in 1959. In line with existing policy which states that the officer in charge of arranging a military funeral shall be from the same service as the deceased, the Commanding General, Military District of Washington, Maj. Gen. Paul A. Gavan, became responsible for planning the ceremonies for General Smith. An immediate requirement facing General Gavan, raised by Mrs. Smith's request that her husband's funeral be similar to General Marshall's, was to obtain Department of Defense clearance for joint service participation. This clearance was readily granted. General Gavan and his staff then made plans based largely on the records of General Marshall's funeral, but varying in several respects. The essential difference was that General Smith's body would not lie in the Washington National Cathedral as had the body of General Marshall. Diagram 48. 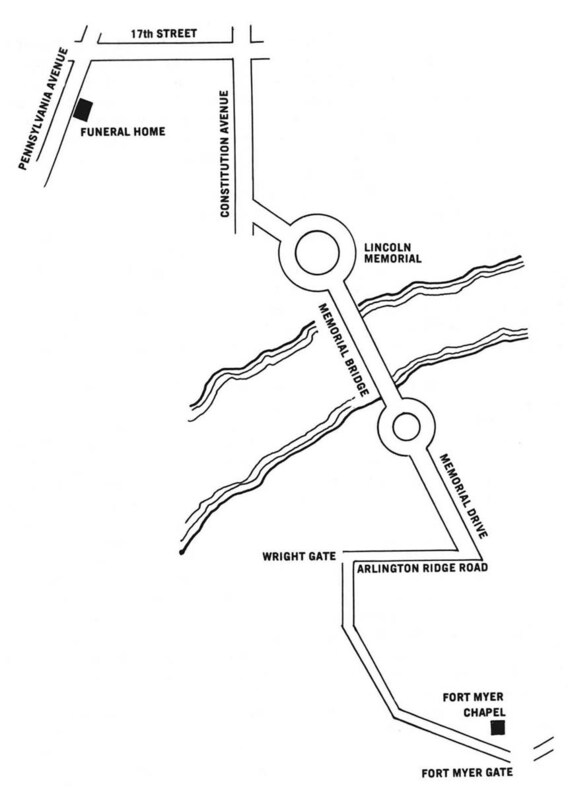 Route of march, funeral establishment to Fort Myer Chapel. burial service was to be held at the Arlington gravesite. At Fort Myer most of the mourners were seated in the chapel before the arrival of the cortege. Among them were high military officials, members of Congress, and a number of foreign diplomats. President John F. Kennedy was represented by his Army, Navy, and Air Force aides. Outside the chapel fourteen honorary pallbearers formed a cordon at the entrance: Morehead Patterson, Carter L. Burgess, General of the Army Dwight D. Eisenhower, Louis Marx, David Marx, General George H. Decker, Robert A. Lovett, Samuel C. Waugh, A. F. Wechsler, Robert Murphy, John Snively, Marion Blazek, Paul Stone, and Allen W. Dulles. At 1055 the Smith family walked through the cordon and entered the chapel. Waiting near the honorary pallbearers was Bishop William R. Arnold, Military Delegate to the Armed Forces of the United States from the Office of the Military Ordinariate of the Catholic Church. Bishop Arnold, who had been the Army Chief of Chaplains from 1937 to 1946, would conduct the mass. Nearby were the body bearers, a joint service group composed of two men from the Army and one man each from the Marine Corps, Navy, Air Force, and Coast Guard. Diagram 49. Position of armed forces honor guard at Fort Myer Chapel. chapel, the hearse at the chapel entrance. (Diagram 50) Bishop Arnold, the mortician, the body bearers, and Col. Richard M. Lee, the commanding officer of the 3d Infantry who was responsible for the ceremonies at the chapel site, then moved to the rear of the hearse. At Colonel Lee's signal the honor guard presented arms; the band sounded ruffles and flourishes, played the "General's March," and then began a hymn. 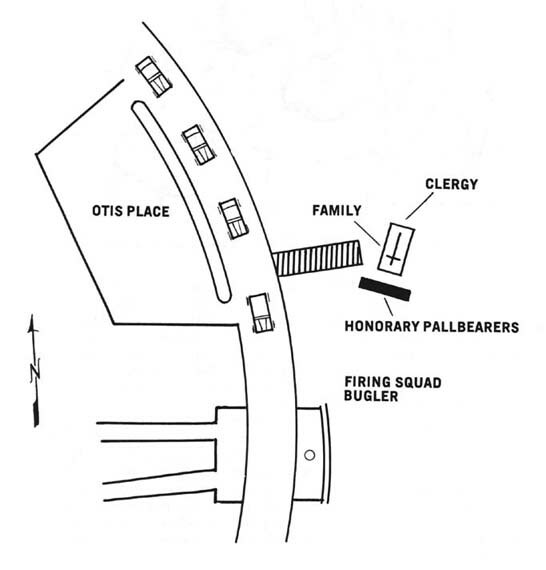 While the hymn was played, the body bearers removed the casket from the hearse and, preceded by Bishop Arnold, carried it through the cordon of honorary pallbearers to the chapel entrance. There the casket was placed on a movable bier; with the bishop still leading, two of the bearers wheeled it to the front of the chapel. The honorary pallbearers followed the casket into the chapel and were taken to their seats. Diagram 50. 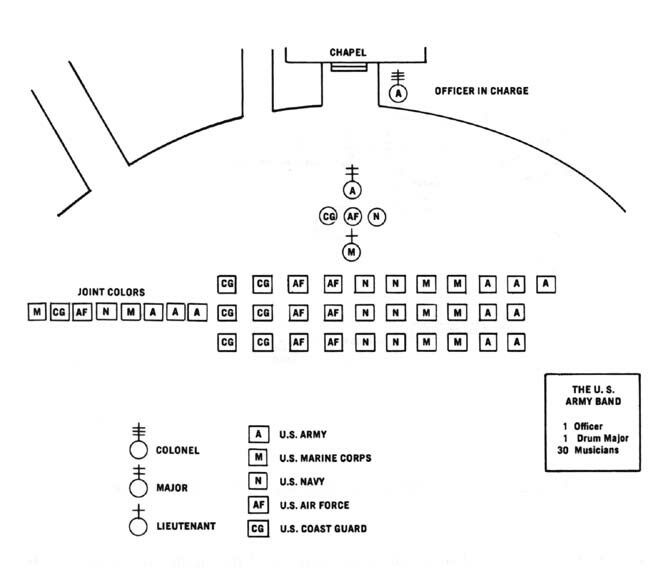 Formation for ceremony at Fort Myer Chapel. casket. Bishop Arnold then led the procession out of the chapel, the Smith family and other mourners following the casket. The armed forces honor guard, which had remained in formation during the funeral service, presented arms when Bishop Arnold appeared at the chapel entrance, while the band sounded ruffles and flourishes and began a hymn. As the hymn was played, the casket was returned to the hearse. Those attending the private graveside rites then moved to their cars. 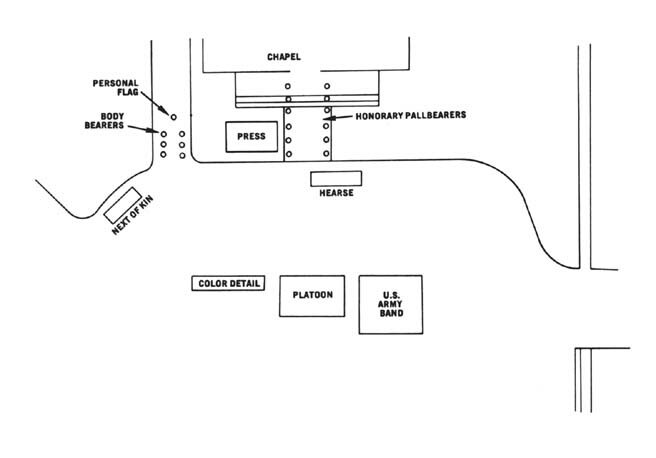 Members of the Smith family, who had waited at the chapel entrance while the casket was carried to the hearse, were the last to enter their cars. The honor guard again presented arms as the cortege began to move through the gate into the cemetery. After the cortege had gone, the guard units, none of which were scheduled for further participation in ceremonies, were dismissed. Since midmorning a detail of one officer and forty-four men from the 3d Infantry had been on station as a security cordon around the gravesite to ensure privacy for the burial service. Inside this ring of troops was another group of one officer and five men to control the press. Diagram 51. 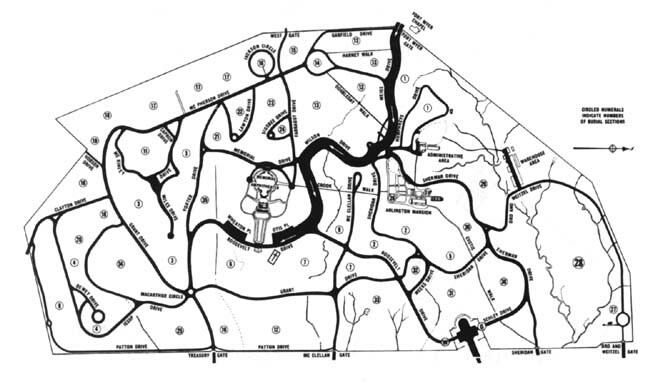 Route of march, Fort Myer Chapel to gravesite. flag bearer, all from the 3d Infantry, and a second armed forces body bearer team of the same composition as that which had served during the chapel rites. it to Mr. Metzler, who in turn passed it to Bishop Arnold. The bishop then presented it to Mrs. Smith. The rites for General Smith, as Mrs. Smith wished, had been conducted with the simplicity and dignity that had marked the ceremony for General Marshall. Diagram 52. Formation at the graveside.